“The world will not rest satisfied,” wrote a reviewer of Emily Dickinson’s poems in 1892, “till every scrap of [Emily Dickinson’s] writings, letters as well as literature, has been published.” Here is how The Gorgeous Nothings, a provocation, satisfies. December 21, 11:19 a.m., Emily Dickinson’s room, Amherst, Massachusetts. Today the sky is a luminous slate. The room in its deconstructed state: stripped of wallpaper and floor covering, the iron woodstove pulled away from the bricked-up fireplace, the walls spotted with spackling and faint shades of paint. Cold, no curtains, the facsimile dresser between the south-facing windows (as if still on view), the narrow desk askew of the southwest corner, and the chair oddly placed at a distance facing the opposite wall. Lifeless as a museum could be, a room in its unnamed state. I switch off the unnecessary floor lamp to avoid false shadows and listen for “Music, like / the Wheels of / Birds — ” but the hour is still, all light and quiet and settled dust. I know I worked myself up to that moment by placing it on an itinerary, travelling from the Emily Dickinson Room — a display with a selection of furniture, paintings, and books from the Dickinson Homestead — at Harvard’s Houghton Library to Emily Dickinson’s room at the Dickinson Homestead in Amherst. I did this to create my own geography, to sketch the spaces and things of Emily Dickinson’s life onto my reading of The Gorgeous Nothings, a collection of her late “ecstatic” writing on envelopes and other scraps of paper published recently by New Directions. 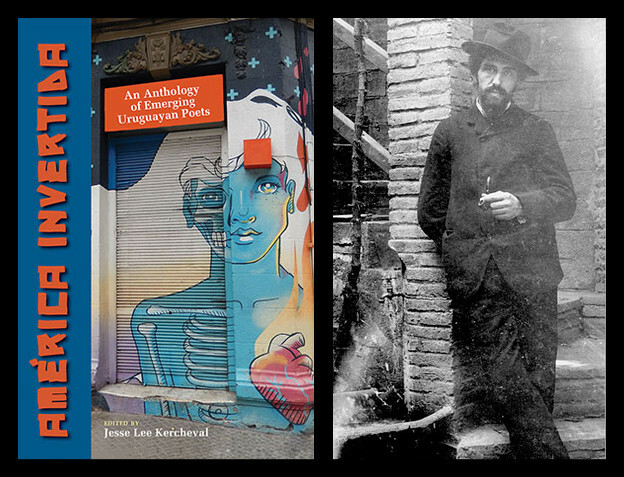 In this book edited by artist Jen Bervin and literary historian Marta Werner, Dickinson’s works are flanked by words suggesting an energetics — velocity, transience, fleeting, light. I’ve come to this moment hoping to locate these archived items (all but one of them housed at an Amherst College library down the street) and their words within a space of practice. The itinerary suggested itself a month earlier while I was planning a holiday trip, but it is initiated the moment when, my feet having moved me to the receptionist’s desk at the Houghton Library, I asked to see Emily Dickinson’s desk. This formalized my seeking not after objects but the residue of inhabitance. First it is suggested I return two days hence for the weekly tour. But that won’t suit my itinerary; “I’ll be in Amherst by then,” I say, perhaps not meaning this to sound important. “You just want to see the desk?” I am asked. Yes. A phone call is made, and I am given a quarter and directed to the lockers. Unburdened of my belongings, I then await my host, who soon leads me up the rotunda steps and into the sealed inner chambers. At the threshold of the Emily Dickinson Room she releases the fat velvet sash from its catch, takes the few steps across, and pushes back the wood shutters. In the archives and sheltered rooms, nothing is to be touched without very special permission. Dickinson’s now fragile herbarium — dried specimens of flowers she collected and grew and labeled and arranged in a book — is kept permanently out of view. One is not allowed to take photographs in the Emily Dickinson Room at Harvard or in the Dickinson Homestead Museum. 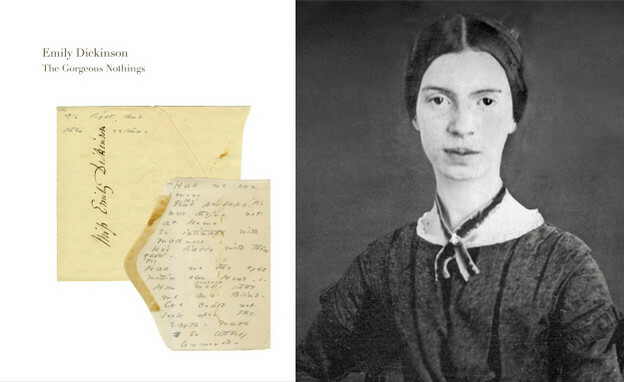 Online, one may see digital images of many archived Dickinson materials — drafts, fascicles, correspondence, the envelope-poems of The Gorgeous Nothings, even Emily Dickinson’s desk and chair. While such “open access” may bring many literary scholars closer, it will serve to keep readers hungry to encounter things-as-they-are that much further away. With digitation comes a further justification for maintaining the divide; one must now make a case for viewing the original, for why the zoomable digital image will not do. These are my thoughts after a brief exchange with the archive’s guardian just outside the Emily Dickinson Room. She had pointed out some manuscripts in Dickinson’s hand on view in the case in Keats’s Library. I recognize the shape of a small triangular slip of paper under the glass case. This, it turns out, is the one envelope-poem that Harvard possesses (H B 3, I learn later, after consulting The Gorgeous Nothings). It is the only original I would, on this journey, see. But I don’t really see it. I copy down the opening lines, I’m talking and being talked with, I’m taking notes. Because I want to hold it, I ask if I would be able to see any of the Dickinson materials housed elsewhere in this building. “One must have call to study some aspect of it physically,” I am told, and in my notebook I jot down Shadows! Depth! Paper! “Eternity will / be / velocity or Pause.” These are its (ironic) first lines. When we walk into a place like this, there is the matter of how we are permitted to look at things. Poet and scholar Susan Howe, in My Emily Dickinson, refracts the power of academic institutions — concentrated in editors, archival regulations, schools of criticism — that controlled Dickinson’s reception, wresting the poet’s image from its former literary confines. Howe researched and wrote in a predigital light, and in her radical rejection of such frames she reveals how scholarship’s textual conventions mediate and limit possible relations to materials. We are left pining after more such views, some of us determined in one way or another to become interlopers into sheltered spaces ourselves. Whereas my visit to the Emily Dickinson Room is spontaneous, I emailed weeks ahead of my Amherst visit to request special access to Emily Dickinson’s room. I did look long and glance again out of each of the room’s four very tall windows (of two six-paned sashes), then again out of the pair of windows on the two windowed walls. I did walk up to the west-facing window with its view of the Evergreens beyond a stretch sparsely treed with pines whose canopy now spreads just at the height of the homestead. I did look through the large squares of glass, and down at the sill where Dickinson would rest a basket to be lowered to children below. I did measure the width of the sill with my handspan. Yes, Emily Dickinson could rest a basket to be lowered to those below. I might have been looking through the feel of being both within the space of the room and out, the feel of connection and distance. The feel of that was this: above the mantle, the chimney beneath wall plaster continues to rise beyond the top of this upstairs room, going up like a spire; out the windows the lightness and light and sky above; the solid floor and family and foundation below. As if built up from. Contained, yet dispersed by the open vantage of four large windows on two walls. The feeling of floating with winter light, bright and surrounding, the shadow of pen tip on paper a kind of companion, the shadow always under or just covering the script, creating a horizon, the weight of it on the paper a sturdy contrast to the feel of the solid walls. The Gorgeous Nothings is produced in a conscious relation to the receding material archive, to the distance between its objects and their formerly lived spaces. It erases that distance (or hopes to) — for despite its heft and sheen, it is less a coffee-table than a laptop book. This is the sense I get on another day near the middle of winter when I place The Gorgeous Nothings open on my lap and am drawn immediately into the images. The facsimiles float above their carefully erased shadows. Because the images seem to sit atop the page, the hand wants to reach for them. As on a computer display, they won’t yield to the touch — “Suspended in air, flickering between presence and absence, they ideally appear very close and very far away at once,” Werner has written. Individually on the page, the items seem magnified visually, presented full-size but appearing large next to their much smaller, plain transcriptions. These look archaeological, like the interpretive display encountered at the museum next to ancient glyphs. They emphasize the fact that the envelope-poem is irretrievably withdrawn from its context. And in the form of the book itself, a small history of writing and publishing plays out: imagine, in the facsimile, the poet’s hand grasping its two-inch pencil (pictured on page 12); and in the more contemporary rendition, the interpreter’s hands at a keyboard, on a mouse, adjusting word and line just so; and at the book’s seam, the chasm between the valued object and its representation. In this way, The Gorgeous Nothings dramatizes the status of these objects. But it also delivers the archive. The big material fact of this book cannot overstate the brilliance that emerges from it. It is both the gallery Howe had hoped the envelope-poems be shown in, to highlight the “balance between poetry and visual art” in many of these specimens, and (Werner’s hope) “a kind of light-table for these writings.” The book provides the feel of handling the conveniently or lovingly or frugally reused scraps, of turning one, of looking it over. The life-size facsimiles are usually presented with the “exterior” side of the envelope first so that one might encounter the aged script of an original addressee, in ink, in Dickinson’s fair-copy hand. There is the sense familiar to anyone who’s pored over archived writings, of discovering, of entering into a relation to the materials and their conditions. If as readers we are also searchers in materials, their conditions, and lives lived with and through them, then we will find The Gorgeous Nothings in step with this practice. It delivers the archive like this: when it is opened before us, we are bombarded by its light. The images draw us into an inviting, almost organic embrace. “The inaudible whirring of the envelopes is part of the message they are sending.” It becomes part of the energetic universe as the late afternoon winter sun splashes upon its pages. It takes me several days to take in all the images in The Gorgeous Nothings. It’s hard to believe there are only fifty-two envelope-poems. It seems an endless world. Like snowflakes — each of its own design and taken together, a different phenomenon. The intention in The Gorgeous Nothings is not to “manage” but to gather these works in scope, immense and unimaginable, in a way that conveys their immensity and curbs their unmanageability. The eleven indices that conclude the volume place the envelope-poems in different flocks or groupings (Index of Envelopes by Address, Index of Envelopes Turned Diagonally, e.g., etc. ), like so many surfaces of a prism into the center of we know not exactly what. They reflect, without delimiting, a sense of the scraps’ liveliness that Werner conveys thus: “If, in a given moment, one or two seem to be in close touch, each in the next moment seems remote from the others, unassimilable to a larger figure, whose moving edges drift and blur” (“Itineraries,” 219). The indices collectively effect a multiplying. The arrays together return the pieces to the disarray that lies hidden in many archive folders, boxes, and envelopes. This is another way in which The Gorgeous Nothings delivers the archive. The indices also reflect some of the fact of Dickinson’s objects; they “are not a series or discrete body of works,” Bervin writes, but each exists with “its own complex constellation of affiliations with manuscript drafts that one can trace through sources” — the 1,414 contemporaneous poem drafts and 887 letter drafts in which text of the envelope-poems also appear. Written between 1864 and 1886, these scraps are, for Werner, a migration underway in a “freer air” (“Itineraries,” 207), beyond the freedom of the bound fascicles, the latest of which Dickinson probably composed in 1864. In the archives and sheltered rooms, one enters into a circumscribed relation to the materials and their conditions. Still, one begins creating a web of associations that weds one to their time and place and use, that deepen one’s sense of these things. And in the imagination they take on a reality of their own. I recall my first visit to the Emily Dickinson Room, many years ago, when a friend (I shall call him John), employed in some minor capacity at the Houghton Library, unlinked the velvet sash across the doorway and ushered me in. Standing again in this room, scanning over the desk, pianoforte, dresser, shelves, and chair, I’m struck by the fraudulence of my memory of that visit. The desk isn’t that size and shape, the shelves aren’t that color, there are no fascicles tucked in amidst papers and pencils in a drawer, etc. — but what’s important is John’s eagerness to share a private showing of these literary artifacts. It was an exercise of, a rebellion against, and my first exposure to, the archive keeper’s authority — tinged with the delicious feel of trespass, infatuation, and collusion. Dec. 18: after a quick visit to the Houghton Library, where I was given entry into the Emily Dickinson Room. There is the bowfront four-drawer chest with its inlaid corners, where Lavinia found Emily’s things. And there to the left of the door near the window, kitty-corner to the corner of the rug, is the small, straight, narrow, sturdy square desk and its more shapely Empire side chair, with curvy front legs that kick out the slightest bit forward and a subtler curve to the back legs kicking out a bit to the back too, the simple cut vase-shaped pattern of the splat beneath the curved top rail where she rested her back. I look at the desk up close (it is most certainly her desk), its light cherry brown and fairly fine grain with a few darker swirls of knots — a very workaday “desk” — a nightstand, really — with one notable gauge to the upper left, like a small dagger. I mention the scratches to my guide, and “it’s been refinished,” I’m told, “people didn’t think of it as a relic,” “it had other uses,” are those even Emily Dickinson’s scratches. I’m afraid I’m making too much of it, so I ask her what she thinks of the desk, and she mentions how they speak to her size and the scale, the immensity — “so many poems from such a small surface.” I look at the worn fabric of the chair’s upholstered seat; I look at the worn striped pattern. I study it in detail, only to learn later from the Harvard online catalog that it was one of twelve, that she “might have” used this chair. I pull the brass ring and open the small drawer to hear its scrape. I do not think to ask to sit in the chair. “Have I taken in enough of the desk?” I am asked. I don’t think I’ll ever take in enough of the desk. I’m not even sure I’ve seen the desk, or if I ever will. Or rather, what I see are always a facsimile. The desk is a facsimile. […] The aura that arises from them [her desk and manuscripts] is nothing more, and nothing less, than our longing to have been present in the scene of her writing, in a moment always foreclosed to us. […] There is nothing there. And there is everything to imagine. In the Emily Dickinson Room, I’ve seen a facsimile of the “scene,” the desk and chair where Emily Dickinson sat, mismatched. The austere narrow desk and the small, slightly curvy chair. I remind myself that I am seeing this decontextualized set to body forth a reunion of sorts. I have come here for the scratches, the many tiny thin scratches and the few deeper longer valleys and the one dagger-shaped indent and the small gouge. And there is everything to imagine. I am stretching out a geography, sketching spaces I will carry with me to Emily Dickinson’s room. The iconic desk, Werner insists, “could not have been Dickinson’s writing desk — at least not her only desk.” There is also the matter of the “writing board, 16 x 19", painted white on one side, curved, with rollers that appear to fit over the knees.” Although unconfirmed as an authentic Emily Dickinson Desk, this “tabla rasa and mystic writing pad,” “riddled with myriad fine cuts,” allows us to adjust the poet’s limbs into other positions, to imagine a variety of times and conditions that may accommodate the act of writing. Sitting on a bed, knees drawn in to work as a desk (how I edit my essay now), or a lap desk propped on knees. The actions of the instrument anticipate or lag behind or keep apace with the mind’s full wordy echo. I look at my own handwriting closer now — its hasty loops and lines and dots existing in a rich manifold of lexical options, as absorptive as the words themselves. The facsimiles won’t yield entirely to the touch, but invite further elaboration of Dickinson’s tactile writing practice. If we see writing as a “somatically inflected sign, a production of the bodily self which seeks identity in an image of its own making,” in Dickinson’s infamously unusual script (“fossil-tracks of birds,” T. W. Higginson had called them), we see something of her materiality. And we may revise and recharge the collective image of Emily Dickinson’s limpid hands — the only image we have of her hands — in daguerreotype. What we see after reading The Gorgeous Nothings is not merely handwriting — but hands tearing, folding, pressing pencil into linen, filing, brushing back a stray strand of auburn hair, reaching into, retrieving scraps from, her dress pocket. “Reaching for writing surfaces that were most likely collected and cut in advance, prepared for the velocity of mind,”  writing surfaces that suggest an “attitude of astonishing recklessness” — Dickinson writing on anything she could get her hands on, the merest scrap nearby. Her working artist’s hands may finally be connected to a body in motion. Where in the archive I was shadowed by Werner’s image of the facsimile desk, in Emily Dickinson’s room I am charged by this other emerging image. December 21, 11:19 a.m., Emily Dickinson’s room: I sit compact in the portable visitor’s chair. I begin to imagine Emily inhabiting this light-filled room, pushing her lexicon into the new dimensions, textures, lines, and curves emerging under hand. In this light, I can imagine the alphabet of her working body, the different morphologies the writing body takes. I can imagine her standing up, raising her arms up to walls, and writing as if in flight, her small body in its simple dress stretched upright supine along the wall, measuring her length and solidness against the solid house. Or maybe she lay on the floor occasionally, just to feel the gravity of her pencil in a different way, or to keep writing though physically tired of sitting upright, her mind still flying. These are some ways she might stretch out the space of the impossibly small desk, interpolate multiple surfaces into her writing. I can walk one length of the room on a floor runner, from the door in the east to the window in the west, but the largest portion of the room is roped off. The archaeologists are still analyzing wear patterns on the floor to determine where her furniture was positioned. But to my eye, there is nothing scratched even dully to excite the analytic mind. There is light. I trace multiple possible footpaths along the floor. In time lapse it is a dance, feet flying across the floor, arms sweeping broad arcs in small arcs of written symbols. This is the sense we get from Bervin’s “Dickinson Composites,” outsized stitched transcriptions on large-scale embroidered quilts recording Dickinson’s dashes, crosses, and other marks often omitted in transcription. In its largeness it suggests the arc of the world her arms may create, gesturing across spaces surrounding the page, extending the scene of writing. In her room, amidst the feel of views going out and arriving, I imagine an exchange with the sensate, sensual, living, dynamic, emergent, listening, sounding, kinetic, resting, and reviving world. Because I imagine this way, Emily Dickinson’s room becomes a huge net of words, a fluid, constantly rearranging lexicon. Dickinson wrote, in her second letter to Higginson (1862), that “for several years my lexicon was my only companion.” The envelope-poems aren’t dead letters, as though intended for circulation and never to reach their recipient. They are where her words fly along new contours; along a continuum they arrive at and leave her hands. Coming from, going to, somewhere. Here stopped by Emily Dickinson’s pencil. I see, of course, only what I see in the mind’s eye. For […] like everyone, I have arrived too late: I do not catch Dickinson in the act of writing. I, too, of course, have arrived too late, even for my own imagination. It’s not that I wanted to imagine Dickinson’s body per se, but I wanted a sense of how she moved about in that space, how she rewrote how it contained her. I brought my holographs into the room with me, but the room would not map onto them vividly enough. Walls, floor, ceiling — I did not see there what she saw, though I tried to feel in my body the ghosts of the movements of hers. If I was dancing inside it was an expression I’d worked up in writing. I saw and felt that space through how I had already imagined at an early point in my itinerary (perhaps in the Emily Dickinson Room) seeing and feeling and being and writing in Emily Dickinson’s room. But what we want for (or from) Emily Dickinson is to experience the concrete mutability of life, mind, and site. So we invent ways to catch Dickinson in the act of writing. For Werner in particular, the scraps Dickinson left behind remind us that a writer’s archive is not a “storehouse of easily inventoried contents — i.e., ‘poems,’ ‘letters,’ etc. — but also a reservoir of ephemeral remains, bibliographical escapes.” I choose to read this last word as landscapes, because Bervin and Werner prompt us to read these small works as part of a larger literary-material landscape. I wasn’t yet thinking about this as I looked out through the gently warped panes of Emily Dickinson’s window onto her landscape. The room commands a wide view — to the south would have been a field of several acres and a cottage, but I have to edit the false sense of vista. When she lived in this house after her father had returned them to it in 1855, the front of the house was shaded by a row of mature trees. From the looks of their silhouette in a photo in the museum brochure, perhaps elms. December 21, Emily Dickinson’s room: In the midwinter day brightness of this year’s solstice, I focus on the light because in life it is a constant. I think now of Dickinson writing awash in a light embraced almost all around by windows, and the moment (if there were but one) “when […] a sudden light on orchards, or a new fashion in the wind troubled my attention, I felt a palsy, here, the verses just relieve” (as she wrote in her second letter to Higginson). I’m not trying to make any assumptions about her embodied experience — to say whether she felt paralysis, tremor, weakness, helplessness, or fear, or any other thing palsy might suggest — but to be present to visiting sensations, like a healer with no body to heal but my own. I imagine, in the vibration of the now of that room, I felt alive in an entirely ordinary way except that I imagine now the energy coursing through the connective systems that make up the density of my physical body, at all points, meeting with that space. I imagine this as a vivisection making every part of me available to the pulsating writing-being of that moment, to the alternating currents of taking in light and putting out words in a continuous, simultaneous exchange. I enter this room as a sacred space because in the geography of my imagined mind-body I have room for the experience of such spaces. And there is everything to imagine. Perhaps, in my journey from the Emily Dickinson Room to Emily Dickinson’s room — from where her writing desk and chair are dimly kept to where their reproductions catch diurnal rhythms — I created or discovered something that could bridge these two worlds. Perhaps, in my own daily rhythm that looped in this place for a day, having driven from Boston, having arrived and supped and visited Emily Dickinson’s room, walked and dined and slept, and awoke in the inn across the street within view of Emily Dickinson’s window, and having walked around Amherst and having again visited this room; perhaps, in the rhythm of breath or in the tilt of my head up to the window and the sweep of my face up from my notebook page and across the surfaces of that room and back down to the page I was writing on, and in the inconsistent rhythm of my handwriting — Emily Dickinson’s bird walked in the form of my hand — perhaps in the continuous and overlapping juxtaposition of all of these gestures my Emily Dickinson emerges. If I have bodied forth a reunion of sorts, it has been through various connections. My journey is like a string and if I snip the end just at that moment prior to the moment of waking in Cambridge, Massachusetts, and thinking “I should go see Emily Dickinson’s desk”; and if I snip the other end just after that moment when I said to myself “I suppose that’s enough” and stopped writing in my notebook in Emily Dickinson’s room; and if I fasten the string round the back of my neck so all the experience is jumbled up in a knot that rests just above my sternum, then that is what I have brought here, and that is what I have given. It’s just another portion of my line being drawn with its excited knots of attention on an itinerary revised by the writing of Emily Dickinson. There is the going and the being there and the leaving. There is the feeling of never having stayed long enough. In the facsimiles in The Gorgeous Nothings we are invited to face the “shining physiognomy of her work” (Werner, “Their period”), to go further into the peculiarly shaped planes she invented from the options her world put before her. In its shapes we are invited to think about the quickness and mobility — transience, Werner would say — of her writing, fit around the curve of an envelope flap, tucked in a “pocket archive” (as New York Times reviewer Holland Cotter adroitly put it) with her two-inch stub of a pencil and pulled out for amendment or revision. 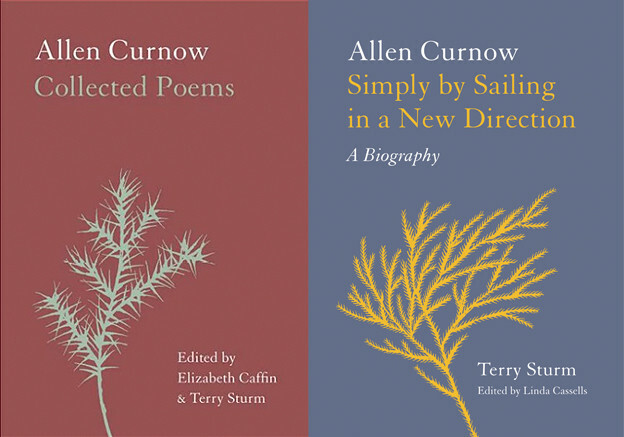 If poetic form embodies an encounter with the world at hand, what we may see embodied in her envelope-poem forms is her body, how she used it, travelled with it through sharp moments and long days of writing. The obstacle to grasping Dickinson is, having arrived too late, possibility foreclosed. Higginson wrote that with the announcement of Dickinson’s poetic genius “came the problem never yet solved, what place ought to be assigned in literature to what is so remarkable, yet so elusive of criticism.” Werner dissolves the “problem” of “place” by setting them in flight, writing beautifully in her essay’s concluding section about their vibrancy, and offering, through the figure of the “liberator” who releases birds to test their homing instincts, an image of our earthbound relation to that flight. The Gorgeous Nothings invites us into a reading of or along “the trajectory of her [Emily Dickinson’s] hand […] to be ‘carried away,’ jolted by language into a still unknown future.” It is an invitation, Werner says, that Dickinson’s editors have refused to take. “For almost twenty years,” Howe writes in her preface, “few poets and fewer scholars, after seeing the originals, have dared to show us the ways in which what we thought we saw was not really what was there” (6). Because it presents several ways, The Gorgeous Nothings invites new imaginations to dispel what they thought they saw before. To a life shrouded in mystery (her shadow behind a curtain in the pre-dawn light, love letters, prescriptions for epilepsy), The Gorgeous Nothings propels the evolving image of the poet in late life (nearly fifty-six when she died), what we allow her to be — not the daguerreotype, not the virginal myth, not frustrated lover, not the impossibly tiny desk and chair. The possible “flocks” give us a greater sense of an interior of a creative life, the other side to the image of poems and fascicles filed at rest in a drawer. The lack of an “authoritative” reading frets no one involved in this occasion. “still en route, their itinerary open” — I take this book as an invitation to live along with these works and their possible trajectories. I do not catch Dickinson in the act of writing, but I now have an image that fuels me. Clearly, this isn’t just about Dickinson anymore. I am not a biographer trying to enter and envision the poet’s life. I prefer the “not seeing” of which Werner speaks because it moves beyond the blur and crisps the imagination of the scene of writing, makes the mind sharp in its own sketches. I am not a Dickinson scholar; I’m merely taking part in the scope of engagement — there is everything to imagine — invited by The Gorgeous Nothings. In their writings, Werner, and Howe before her, have showed me how as we analyze and explain, we imagine. And they’ve led me to this working conclusion: scholarship is important not for the facts it disposes us to or the arguments it makes, but for the way it lets us experience human imagination, selfhood, and connectedness. I felt I couldn’t possibly stay there long enough, and yet it didn’t seem to matter at what point I parted, whether I lingered a few minutes more or not. 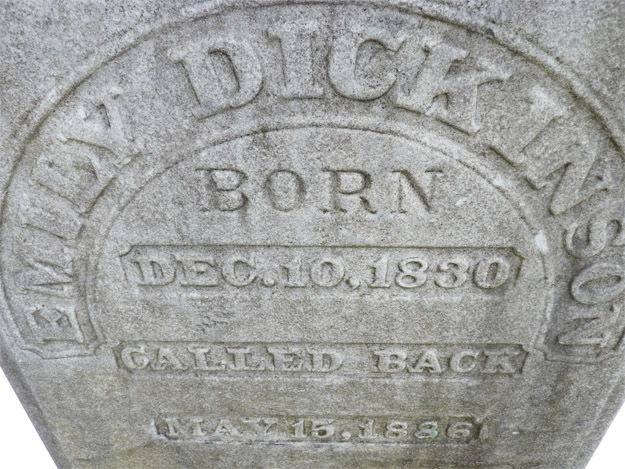 As I looked at the simple gravestone (given name, surname, two dates), I thought to look at the back of it — I don’t know why, perhaps because it is so muted in its statement of having been, of going. I was gaining a sense of its situatedness, its physical fact. On the back, in a single column of text, is the poem “Look at the light of this hour.” These words direct one away from the stone, from the past life it humbly commemorates, from the remains whose site it identifies, into the moment of one’s living experience, their perception of this moment in this space. “Look at the light of this hour” — I did. And later, I thought of the generosity of this parting (or greeting) gesture — to return someone, with the not-so-gentle suggestion, practically a command, to “Look” — to their experience of the moment and its larger context, to the life being lived (mine) that continues as it moves away from that moment. As I think of it now, somehow the problematic of leaving, of not knowing when to, seems resolved. In truth, you never leave such focal experiences, you only draw further away from the center they have momentarily created. What had I done as I sat in Emily Dickinson’s room but look at the light of this hour? What does one do at the light-table of The Gorgeous Nothings? December 21, 2013: a view of Emily Dickinson’s gravemarker. 1. Thomas Wentworth Higginson, “Emily Dickinson’s Letters,” The Atlantic Monthly, October 1891;Emily Dickinson, Letters 68, no. 4; 444–56. 2. Susan Howe, My Emily Dickinson (Berkeley: North Atlantic Books, 1985; reissued New York: New Directions, 2007). 3. Marta Werner, “‘Their period for Dawn —’: Housing Dickinson’s Late Work,” The Emily Dickinson International Society, July 19, 2013. 4. Susan Howe, preface, The Gorgeous Nothings, ed. Marta Werner and Jen Bervin (New York: New Directions, 2013), 6. 6. Werner, “Itineraries of Escape: Emily Dickinson’s Envelope-Poems,” in The Gorgeous Nothings, 217. 7. Jen Bervin, “Studies in Scale: An Introduction,” in The Gorgeous Nothings, 10. 12. Bervin, “Studies in Scale,” 9. 15. Johanna Drucker, The Alphabetic Labyrinth: The Letters in History and Imagination (London: Thames and Hudson, 1995), 19. 16. Johanna Drucker, Figuring the Word: Essays on Books, Writing, and Visual Poetics (New York: Granary Books, 1998), 59. 18. Bervin, “Studies in Scale,” 10. 22. Holland Cotter, “A Poet Who Pushed (and Recycled) the Envelope: ‘The Gorgeous Nothings’ Shows Dickinson’s ‘Envelope Poems,’” New York Times, December 5, 2013. 25. Reviewers have made scant mention of the essays accompanying the images, but they are necessary reading. Werner’s, an illustrated guide, is valuable on its own, but housed in this book, her breadth and intimacy with the original of these shining facsimiles animates them. 28. J1733, F1342B, quoted in Werner, “Itineraries,” 210.